Neapolitan pizza, or pizza Napoletana, is a type of pizza that originated in Naples, Italy. This style of pizza is prepared with simple and fresh ingredients: a basic dough, raw tomatoes, fresh mozzarella cheese, fresh basil, and olive oil. No fancy toppings are allowed! One of its defining characteristics is that there is often more sauce than cheese. This leaves the middle of the pie wet or soggy and not conducive to being served by the slice. Because of this, Neapolitan pizzas are generally pretty small (about 10 to 12 inches), making them closer to the size of a personal pizza. Neapolitan pizzas are also cooked at very high temperatures (800 F to 900 F) for no more than 90 seconds. 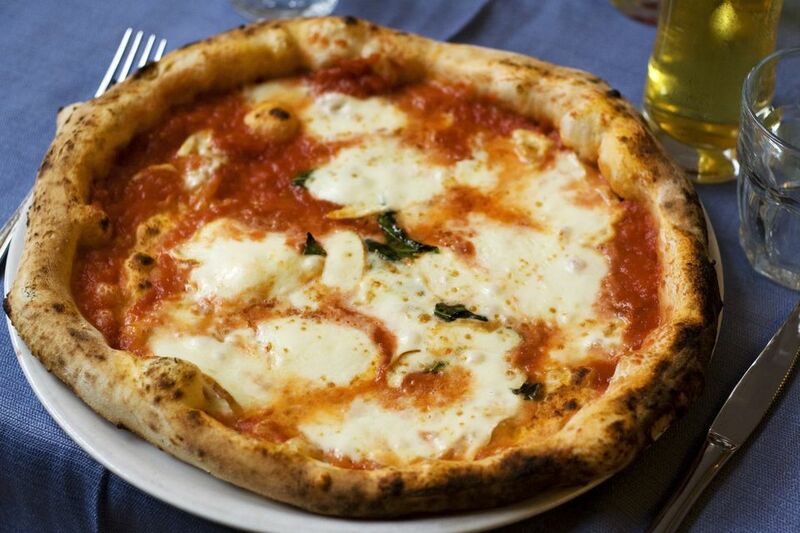 Pizza as we know it today (dough topped with tomatoes and cheese) was invented in Naples. Before the 1700s, flatbreads existed but were never topped with tomatoes, which is now a defining characteristic of pizza. Tomatoes were brought to Europe in the 16th century by explorers returning from Peru. However, many Europeans believed tomatoes were poisonous until poor peasants in Naples began to top their flatbread with them in the late 18th century. The dish soon became popular. Many visitors to Naples would even seek out the poorer neighborhoods to try this local specialty. Marinara pizza does not have cheese. It received its name because it was traditionally prepared by “la marinara” (a seaman's wife) for her husband when he returned from fishing trips in the Bay of Naples. Baker Raffaele Esposito, who worked at the Naples pizzeria “Pietro... e basta così,” is generally credited with creating Margherita pizza. In 1889, King Umberto I and Queen Margherita of Savoy visited Naples. Esposito baked them a pizza named in honor of the queen whose colors mirrored those of the Italian flag: red (tomatoes), white (mozzarella), and green (basil leaves). This is what is now known as the classic Neapolitan pizza today. The Associazione Verace Pizza Napoletana (VPN) was founded in 1984 in Naples. The organization's goal is to certify pizzerias that use the proper artisan traditions of authentic Neapolitan pizza. They have several requirements that must be met to gain certification, and restaurants must apply for it officially. They also have an American branch and there are currently only a few hundred restaurants in Italy and around the world that are VPN certified. The official requirements of an authentic Neapolitan pizza begins with the crust. The dough must be made with highly refined Italian type 0 or 00 wheat flour, Neapolitan or fresh brewer’s yeast (not dry yeast), water, and salt. It must be kneaded by hand or with a low-speed mixer and formed by hand, without the help of a rolling pin. The pizza is baked for 60 to 90 seconds (baking time cannot exceed 90 seconds) in a minimum 800 F stone oven with a wood fire. Many restaurants and pizzerias make Neapolitan-style pizza. These do not adhere to the strict rules of the VPN association or are not certified simply because they never applied. Neapolitan-style pizza typically consists of a thin and soft crust—if it is cooked properly at a high temperature, the crust will bubble up and be charred in spots. That is topped with a simple tomato sauce, fresh mozzarella cheese, and fresh basil.